Take the vacation you deserve and make lifelong memories when you stay in this lovely 2 bedroom, 2 bath unit at Shipwatch Surf and Yacht Club! Located on the river side in sunny Perdido Key, Florida, this conveniently located destination has it all, featuring a large swimming pool, health spa, sauna, Jacuzzi, tennis courts, shuffle board, boat launch, boat/ trailer parking, and clubhouse! Riverside guests also have access to the gulfside pool and clubhouse, and the spacious stretch of Gulf front paradise! Enjoy sweeping views of the Intercoastal Waterway, or take a quick stroll across the street to watch the sun setting over the Gulf of Mexico. Whatever your preference, Shipwatch offers the best of both worlds! 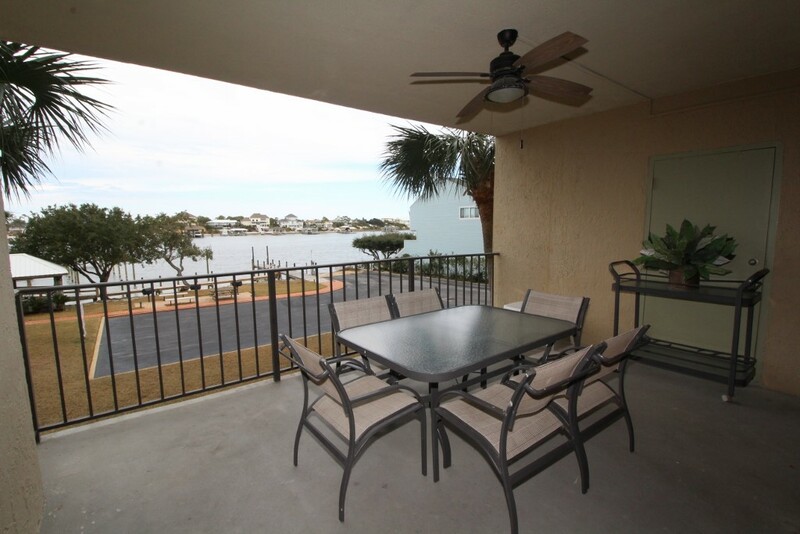 This second floor unit features plush carpeting, a large seating area and lovely bay side views. The dining room seats 6 comfortably! The large kitchen has ample counter space, a multitude of appliances and cookware and a large island with a cooktop, perfect for preparing your fresh catch! The master includes a queen bed with high end bedding. There is a flat screen TV and a loveseat to lounge after a long day. The onsuite has an oversized vanity and shower/tub combo. The second bedroom sleeps 3, with a queen bed and twin. The star of this unit is the large covered terrace with dining for six, and the best sunset views on the key over the bay!